Visit the Twitten Pop-Up Market this Saturday, December 17th, Across from the Railyard & Farmer’s Market! 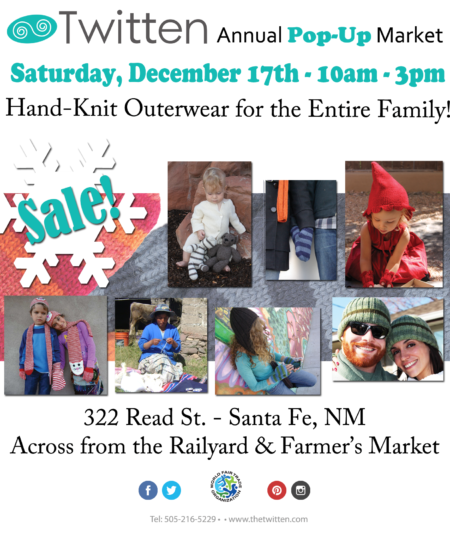 On Saturday, December 17th, Twitten presents their Pop-up Holiday Market, from 10am to 3pm MST. Twitten is at 322 Read Street in downtown Santa Fe, across from the Railyard & Farmer’s Market. You can find more info at thetwitten.com. 100% women owned and operated. Check out our Fair Trade, hand-knitted apparel made in Peru by artisans supporting their traditional communities! Twitten has mittens of all kinds as well as hand-knitted outerwear… hats, leg warmers, scarfs, plus organic and natural fiber clothing for children! Can’t make it to the pop-up market? This deal is only good until 11:59am MST on Saturday, December 17th!